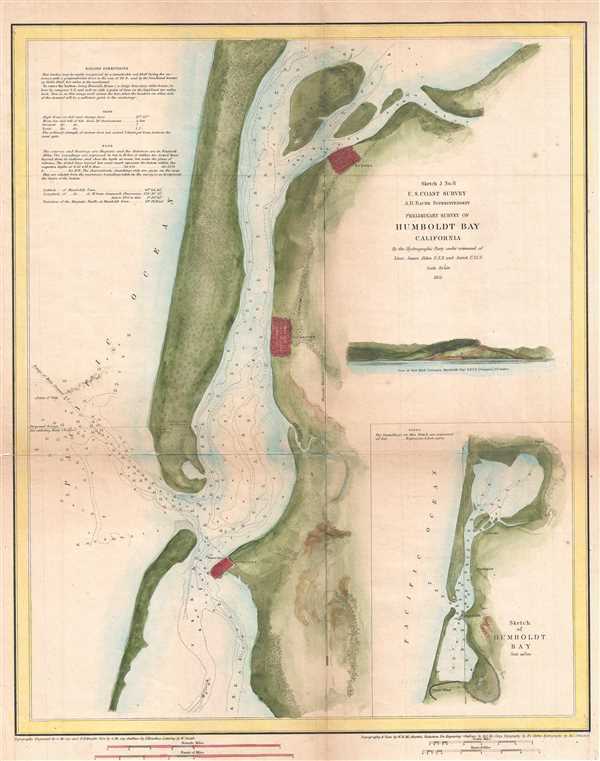 Beautiful nautical chart of Humboldt Bay on the northern coast of California. This is an attractive 1851 coastal map or nautical chart of Humboldt Bay, California by the U.S. Coast Survey. It covers from Indian Island and Samoa south to Fields Landing. The cities of Eureka, Humboldt and Bucksport are beautifully detailed along with other inland features. An inset in the lower right quadrant features a sketch of Humboldt Bay while an elevation profile of the View of Red Bluff Entrance in Humboldt Bay is included above the inset. The chart features numerous depth soundings and sailing directions. Produced in 1851 under the Supervision of A. D. Bache, the most influential leader of the Coast Survey.